Hydropath Electronic Water Conditioners can be customized to suit pipe OD's of 8" to 78". Occasionally there is a need to fit a larger pipe size. Hydropath can design a unit specifically for your requirements. 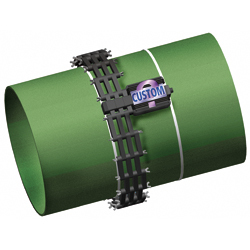 The largest pipe size all Commercial Units can be purchased to fit is an outside diameter of 78" (200cm OD). Up to the date of July 11, 2006 the largest Custom made unit Hydropath has implemented is an outside diameter pipe of 1.5 meters. All commercial/industrial ranges up to 78" O.D. can be custom made. Please contact ECMI for additional information regarding Custom Hydropath Units. Weatherford International has recently acquired exclusive rights for distribution for the upstream oil industry market sector (well to refinery). The agreement was between Weatherford, Hydropath, and ClearWELL, Hydropath's product division for this industry sector. For additional information, please contact Weatherford International. All other trademarks are trademarks of their respective owners. Note: Savastat SC Series units are Hydropath (UK) products, privately labeled for our use.